Fluorescent lighting works differently than other sources of light used in the home. How does it work? An electrical charge passes through a tube filled with argon or krypton gas. The electrical charge makes the gas produce invisible radiation, which interacts with phosphors coating the inside of the tube, causing them to glow. Antoine-Henri Becquerel is credited with developing the first fluorescent light in 1859, but fluorescent lighting did not come to the United States until 1934. Since that time, fluorescent light bulb technology has evolved slowly, but late in the 20th century, lighting designers developed compact fluorescent lamps (CFLs) which could be screwed into ordinary incandescent light bulb sockets. The process that makes fluorescent lights glow takes place at a low temperature, so less energy is consumed. This makes them an energy-efficient alternative in large office buildings, factories, and warehouses, where lots of artificial light is required. Fluorescent lighting also lasts the longest of all the types of lighting, up to 8,000 hours. Fluorescent lights do not burn out suddenly like incandescent and halogen lights; instead they gradually weaken over time. Because they are much more energy-efficient and cheaper to operate, fluorescent lights are particularly useful in commercial settings. Nevertheless, with increasing electricity costs and the need to conserve energy, fluorescent lighting has become more widely used in homes as well. 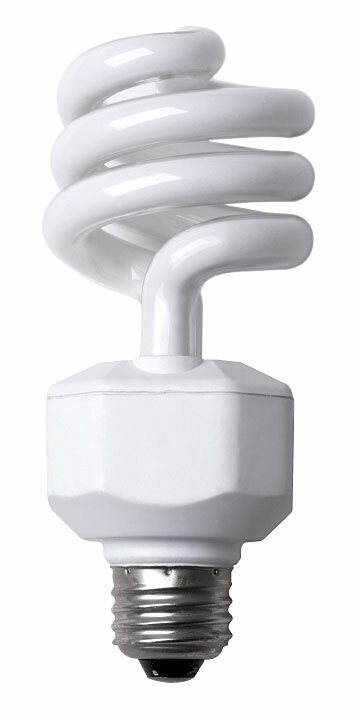 Compact-fluorescent light bulbs sometimes last 10 times longer than incandescent bulbs, and they use about 30% as much energy. Fluorescent light is cool, with a color temperature similar to that of daylight. Because it has peaks in the green and orange parts of the color spectrum, it tends to distort color and does not complement complexions or interiors. Many people think that fluorescent lights cast a "sickly" pallor. For this reason, you most likely see fluorescent tubes in home work areas, like garages, workshops, and basements. Nevertheless, new fluorescent lights that are slightly warmer in appearance have recently been developed in order to address this concern. 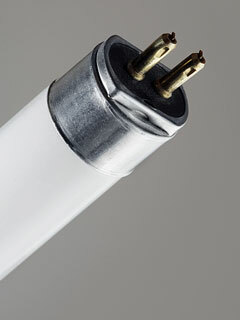 Fluorescent lights are now available in many different colors, from cool blue to warm white. Fluorescent lights come in many different designs, from the standard tubes to compact shapes and tiny tubes no thicker than a pencil. A new type of compact fluorescent comes enclosed in a traditional light bulb, which helps diffuse the light. It takes a while for fluorescent lights to reach their full brightness once their power has been switched on. Fluorescent lights also tend to hum and flicker, and their low-frequency flicker can cause eyestrain and migraine headaches in some individuals. However, new CFLs with high-frequency electronic ballasts, rather than the older electromagnetic ballasts, have largely solved the hum and flicker issues. Fluorescent lights can be dimmed, but the process is more involved and costly than with other types of lighting. Dimmable CFLs are available in specially-labeled packages. 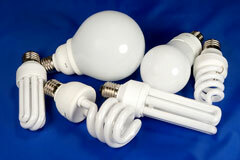 Fluorescent bulbs do contain mercury. Because mercury is toxic, the migration from using incandescent bulbs to compact-fluorescent bulbs has raised concern regarding their use and disposal. The mercury in an unbroken bulb does not present a hazard, and some local jurisdictions are providing recycling areas for unbroken bulbs. If, however, the bulb breaks, experts recommend a careful cleanup procedure. The United States EPA provides guidelines for what to do if a fluorescent light bulb breaks. For information about Thomas Edison's experimentation with fluorescent lighting, visit the Smithsonian Institution's Thomas Edison's Fluorescent Lamp web page.